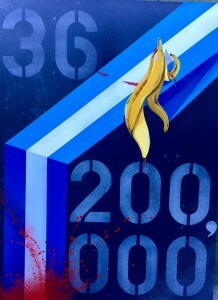 An art piece by Cache, who’s work is a among those being shown as part of MemoryArte. One of the bloodiest civil wars fought on the American continent ended with the signing of the Guatemalan peace accords on December 29, 1996. California State University, Northridge will mark the 20th anniversary of the accord with special exhibition of Guatemalan art, poetry and music on Wednesday, Nov. 30. “MemoryArte: A Critical Reflection on the Guatemalan Peace Accords” is scheduled to take place from 4 to 7 p.m. in room 153 of Jerome Richfield Hall, located on the west side of the campus at 18111 Nordhoff St. in Northridge. It is free and open to the public. The Guatemalan Civil War spanned 36 years, from 1960-1996, as government forces violently fought efforts by various leftist and social justice groups — supported the country’s Maya population — to end economic and social inequalities in Guatemala. At the end of the civil war, there were over 200,000 killed, 50,000 forcefully disappeared, 40,000 widows and 1.5 million displaced. The Guatemalan state forces committed 93 percent of the crimes and 83 percent of those murdered were Mayas. A year after the peace accords were signed in 1996, the United Nations-organized Commission of Historical Clarification released a report condemning the Guatemalan government for widespread human rights violations against its own citizens and for committing genocide against the Maya population in Guatemala. MemoryArte features an art installation of approximately 20 pieces, including a couple that are interactive. About 16 poets will read pieces created for the occasion in English, Spanish, Maya-K’iche and Maya-Q’anjoba’l (indigenous Maya languages). Among the artists taking part is acclaimed Mexican-American photographer James Rodríguez, whose work has been featured in The New York Times and works in Guatemala documenting the country’s citizens search for justice. Also taking part is Los Angeles-based graffiti artist Cache. Born in Guatemala City, Guatemala, Cache is known for his vibrant, chubby chickens, which have become icons in the Los Angeles cityscape. Joining them is Ana Ruth Yela Castillo, a Los Angeles-based muralist and teaching artist who currently has a piece — an altar that honors Central American women — at the Museum of Latin American Art in Long Beach. Other artists, poets and musicians include Lorenzo Alfredo Tambriz, Maricela López Samayoa, Manuel Felipe Pérez, Thomas Germano, Salvador Zacarías, Alejandra Marroquín, Karina O. Alvarado, Manuel Chitay Cos, Emanuel Loarca, Mariana Marroquín, GusTavo Guerra Vásquez, Mario Avila, Genar Alay, German Escobar, Prensa Comunitaria, Sandra Luna and Mario Escobar. Curating the installation is educator and art instructor Fabrizio Flores. Flores has extensive experience managing arts programs, and designing curricula for public schools and civic and cultural organizations. He currently is developing and implementing participatory art programs with artists based on the museum collections and exhibitions at Los Angeles-area museums, including the J. Paul Getty Museum, Craft and Folk Art Museum, The Museum of the San Fernando Valley and the Norton Simon Museum. For more information about MemoryArte, visit its website http://www.csun.edu/humanities/chicana-chicano-studies/events/memoryarte-critical-reflection-guatemalan-peace-accords.